Posted May 22, 2018 by Dr. Glenn Norton & filed under General Dental Articles, Oral Health, Prevention. Asthma is a scary, chronic disease that affects over 20 million adults and more than 6 million children in the United States. If not managed and treated proactively, asthma can make it difficult to breathe, cause the chest to tighten, and can even lead to death. 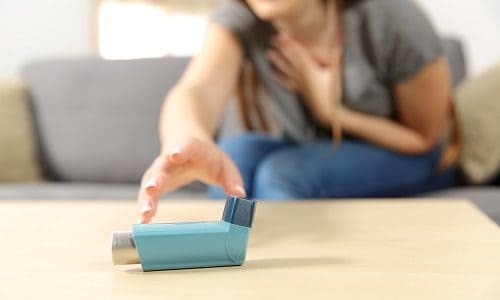 At our dental office in Evansville, we also know that asthma not only affects your lungs and respiratory system, but can actually have a negative effect on oral health, too. Talking to Your Dentist in Evansville. At your dental appointments your team will ask about your health history. It’s important that you let them know you have asthma and share which medications you use so they can keep a close eye on your dental health. We’re always welcoming new patients at our Evansville dental office and would encourage you to call to schedule an appointment if it’s been more than six months since you’ve seen a dentist. Preventive dental care, along with a good oral hygiene routine at home, can help protect your smile from cavities, gum disease, and other oral health concerns.